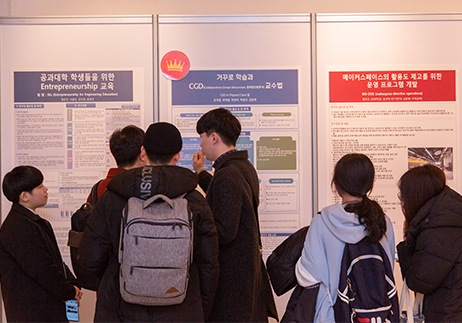 The first joint lecture series developed in cooperation between Korea University and Yonsei University. 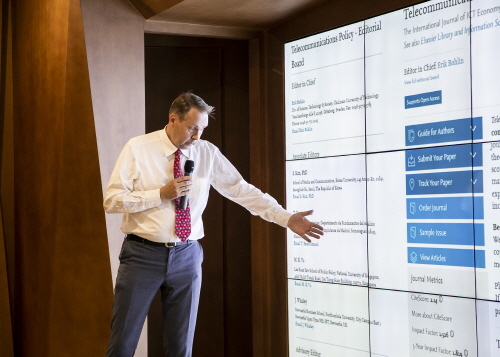 The 13-week lecture series titled “Humanistic Introspection toward Truth, Justice, and Liberty” started on September 7. This course is the first of its kind to be jointly offered by two of the most prestigious universities in Korea. The program is intended to provide their students with better quality education, and was launched based on the two institutions’ shared understanding that there is no wall between universities and academic disciplines. The series will be a rare opportunity for students to listen to the lectures of well-respected professors from the two universities in one setting. The presidents of Korea and Yonsei Universities previously agreed on the need to expand the reach of their mutual exchanges beyond their annual sports competition (the Korea/Yonsei Games) toward academic and cultural exchanges. This joint lecture program is the fruit of their efforts to do so. 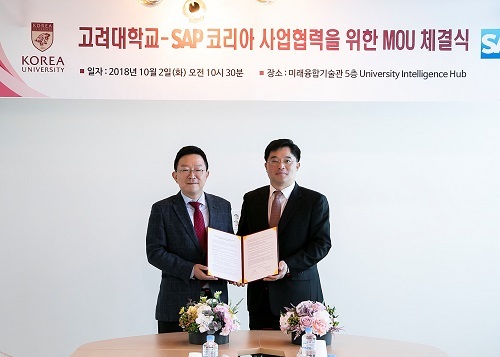 The presidents themselves are also involved in these efforts: President Yong-Hak Kim of Yonsei University gave a special lecture at Korea University this past May and President Jaeho Yeom of Korea University will do his part in exchange at Yonsei University this September. The weekly joint lecture series started on September 7. Its curriculum covers a wide range of disciplines, including psychology, history, philosophy, law, and economics. The two universities had already set up a joint working group in order to coordinate the details of the program. In accordance with the title of the series “Humanistic Introspection toward Truth, Justice, and Liberty,” the professors who take part in the program have chosen a lecture topic related to their own field of expertise and will deliver their lectures at one of the two universities. For instance, a group of professors will give a joint lecture on philosophy at Korea University and another group will present law at Yonsei University on the same day. Each lecture will have one “leading mentor” who moderates a discussion between the lecturers and students at the end of the lecture. Professor Seung-Hwan Lee of the Department of Philosophy at Korea University and Professor Joo-Hoan Kim of the Department of Communication at Yonsei University have been appointed as leading mentors. 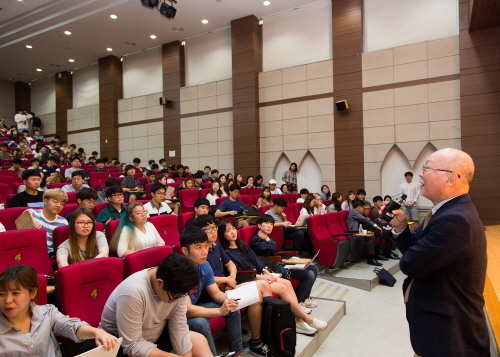 The first lecture was held on September 7 in Room #602 of Woodang Hall at Korea University. The first lecturer of the day was Professor Sungtaek Cho of the Department of Philosophy in the College of Liberal Arts at Korea University. His topic was “Understanding Buddha from the Perspective of the History of Civilization.” Professor Cho started his lecture asking, “Who is the Buddha?” and explained the history of civilization related to the Buddha, specifically under what social, economic, and religious circumstances the Buddha was born. Professor Cho introduced the students to five keywords in order to better understand the Buddha: Humanist, Young, Innovator, Teacher, and Homeless. He explained that the Buddha was a humanist, stressing, “The actions of the mind is as important as those of the body and language. Like the latter two, the actions of the mind have karma.” He added that the Buddha was a reformer who emphasized that reaching enlightenment depended on your actions rather than on your blood in an ancient Indian society dominated by the caste system. He described “the enlightened Buddha” as a man of great charm. “There are many different ways to remember the Buddha. We tend to remember him as a religious figure, but when you keep in mind the five keywords, you may see him as a real person in history and a fascinating individual,” he said. “The discussion on the mind in China became deeper after China embraced Buddhism,” said Professor Shin. He went on to discuss the origin of Chinese bibliography and how Buddhist scriptures were translated, classified, and deciphered. He added that the translation of a body of text that came from India to China resulted in the development of graphonomy and phonology in China. 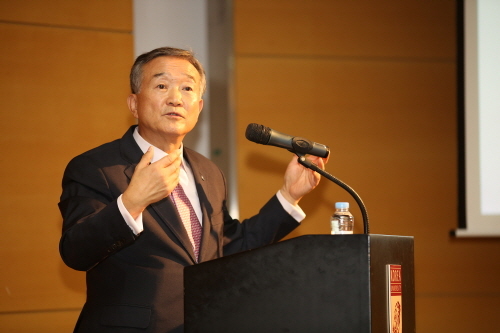 President Yeom of Korea University also attended the first joint lecture. In his congratulatory message, he emphasized the important role that “pioneering intellectuals” can play, saying that learning knowledge by rote to get a decent job is not a way of life that works in the 21st century and that the way knowledge is created is also changing. He said that he was glad that the first joint lecture series consisted of the signature lectures of the two universities. “Most Korean people think studying is labor, because studying and memorizing as much as possible is what they have to do until the end of high school. But you are a generation with an average lifespan of 100 years, or even 120 years. You can’t live your life well only based on what you learned in your early life. You must be equipped with humanistic attitude. Scientific facts can be changed or even overturned if the knowledge underlying them is deficient, whereas humanistic truths only get deeper and deeper as time goes on. I hope this lecture series can inspire your intellectual curiosity and open new ways to improve instructional methods of the two universities,” he added. President Kim of Yonsei University sent a video congratulatory message to the students. “I hope this program will break down the walls between the two universities and between various disciplines and offer our students a great opportunity of academic exchange and interaction between the two universities. 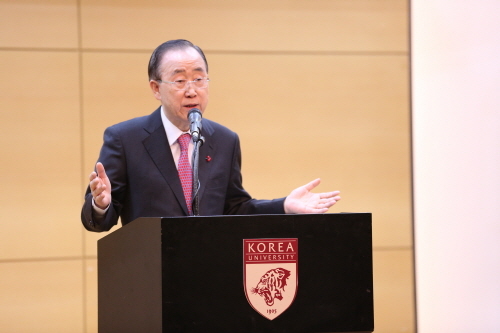 The two prestigious universities will continue to grow with competition and partnership between them,” he said. At the end of the lecture, the students showed enthusiasm for next joint lecture and actively participated in the Q&A session. A total of 400 students are expected to listen to each lecture of the series throughout the fall semester in order to deepen their humanistic thinking.